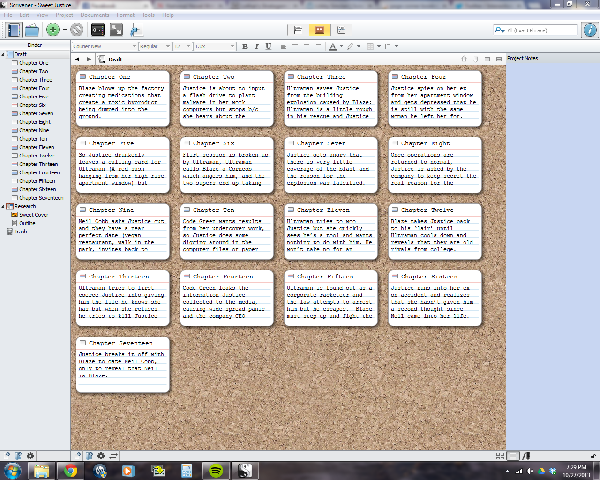 So, this is my novel as it was outlined and input into Scrivener. It’s hard to believe that those 17 note cards will get me to 50 thousand words by the end of next month. I wouldn’t be surprises as things evolve, the number of chapters increases. I’m sure that some of the characters will develop a mind of their own. They always do. But if I stick to this game plan or keep it as current as I can, I’m pretty sure I can rock this out with minimal head desking. I added the word count widget from the NaNoWriMo website to the right, so you can check my progress any time. I’ll try to blog as often as I can. 4 more days!